Product prices and availability are accurate as of 2019-04-22 06:18:21 EDT and are subject to change. Any price and availability information displayed on http://www.amazon.com/ at the time of purchase will apply to the purchase of this product. 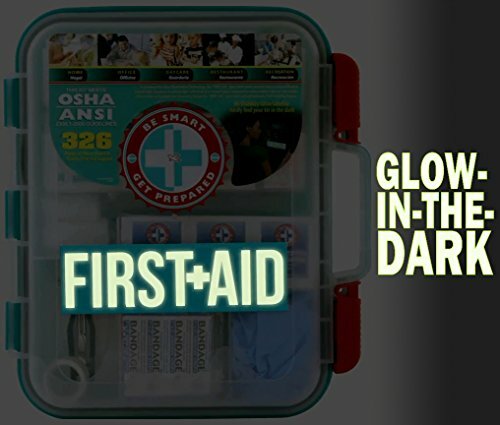 We are happy to offer the fantastic First Aid Kit Hard Teal Case 326 Pieces Exceeds OSHA and ANSI Guidelines. With so many available recently, it is wise to have a name you can recognise. 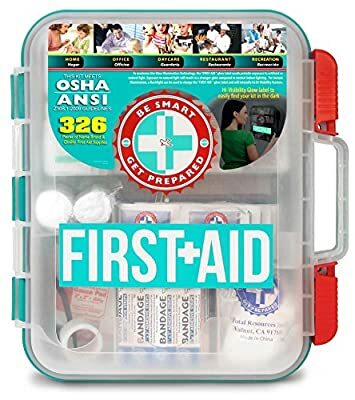 The First Aid Kit Hard Teal Case 326 Pieces Exceeds OSHA and ANSI Guidelines is certainly that and will be a excellent purchase. For this reduced price, the First Aid Kit Hard Teal Case 326 Pieces Exceeds OSHA and ANSI Guidelines comes highly respected and is always a regular choice with lots of people. BIAF have included some great touches and this means good value for money. 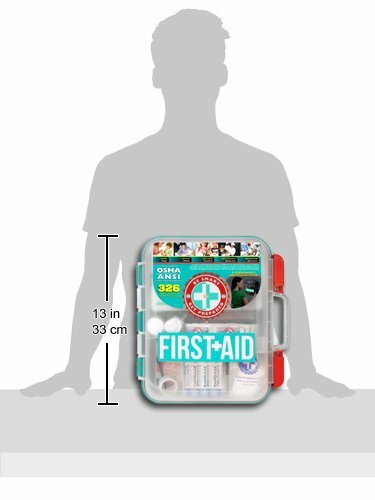 Be Smart Get Prepared First Aid Kit is in a hard carrying case with more storage space inside and a multi-compartment organizer. Can be carried around for portability or mounted on a wall in a central location. Since the office or workplace is where most of our time is spent away from home, employees have every right to feel safe in their work environment. Our kits are compliant with OSHA/ANSI standards and are stocked with comprehensive components that will meet and exceed your requirements. Stored in handy and durable translucent plastic, our kits are organized and allow little to no room for error in treating common workplace mishaps. 1 instant cold compress--6" x 9"
50 adhesive bandages--3/8" x 1-1/2"
60 adhesive bandages--3" x 3/4"
18 wound closure strips--1/4" x 1-1/2"
1 sterile trauma pad--5" x 9"
Made by the number one leading manufacturer of First Aid Kits in the USA. 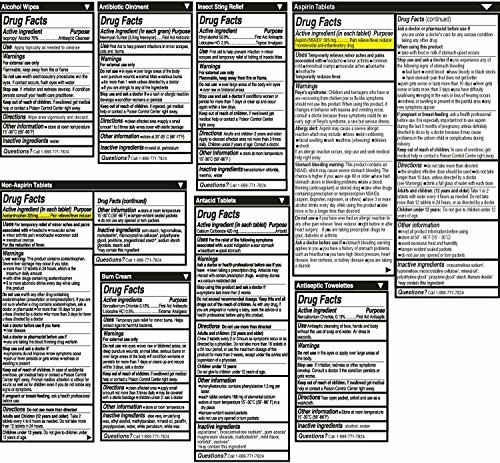 326 pieces of comprehensive first aid treatment products. 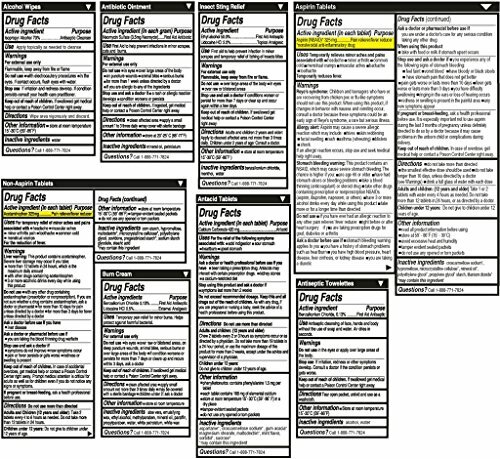 Meets or exceeds OSHA and ANSI 2009 guidelines for 100 people. Ideal for most businesses and perfect for family use at home. Fully organized interior compartments provides quick access. Rugged, sturdy, high density plastic case is impact resistant. Two separate layers of first aid for large and small first aid products and tilting shelves designed for easy access and refill. Wall mounts or folds compactly for storage. Case dimensions: 13" x 12" x 4". Easy slide latches securely locks into place. Includes a refill order form.